Or, in plain English, Paneer Cheese with Fenugreek Greens and Cream. I ask you all–how in the world can this be bad? It contains fried cheese, the tastiest greens this side of collards and cream. The answer of course is: it can’t possibly be bad! And it isn’t. It is, in a word, amazing. The paneer is springy and sweet with a crisp exterior, there are almonds for crunch and a discreet nutty flavor, and the sauce is tangy, creamy and thick, and scented with the rich grassy fragrance of methi greens. I like it even better than mattar paneer, and that says a lot, because that dish pretty much got me to eat peas and actually like them. (Zak still prefers mattar paneer, but he still really liked methi malai paneer, too.) 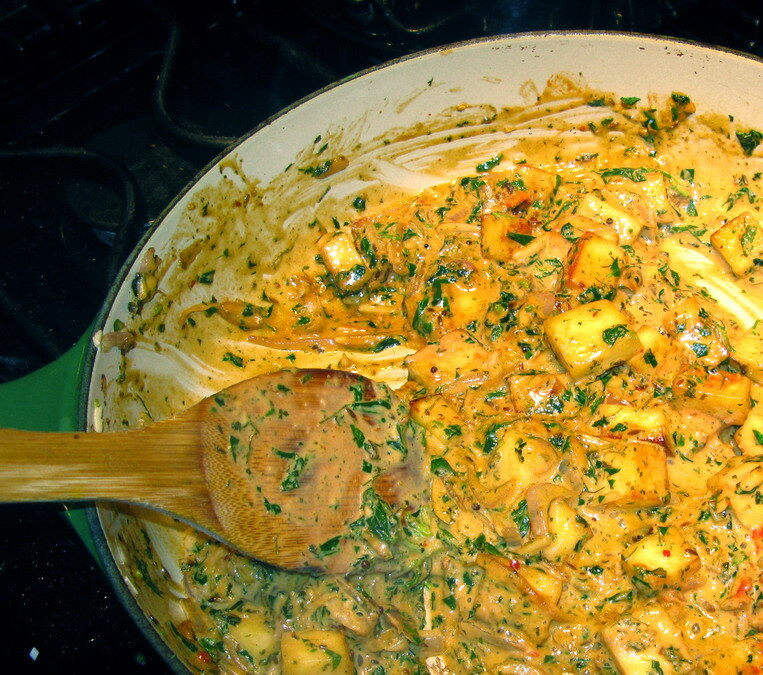 And here’s the great part–it is easier to make than mattar paneer, and it has less fat in it, because there is only 1/2 cup of cream in the whole dish, which will feed four people as part of a multi-dish Indian meal, or three if you are only eating it and some rice or bread. I got the idea to make this from Raghavan Iyer’s wonderful book, 660 Curries, which has become my go-to tome when I want to make Indian food, but I want to make something different, and I don’t just want to “wing it” and make up a Barbara curry. (There is nothing at all wrong with winging it and making my own curries–my curries are quite tasty, but sometimes you need new ideas to spark your appetite.) I was digging through the book, while I still had a gallbladder and was desperately trying to find something I could eat that had flavor, and had found this recipe in the long and drool-inducing paneer chapter. Sadly, though it caused instant salivation, it also made me queasy, because of the butter, paneer and cream it contained. I knew how sick it would make me if I had the audacity to eat it right then. So, I bookmarked it and promised myself to return to it as soon as my gallbladder was out and I could buy fresh methi greens. Now, of course, all of you know that I had to change it a bit. And I did, but I still credit the basic idea of this recipe to the very talented Mr. Iyer. I added browned onions, garlic, some mustard seeds to be browned with the cumin seeds, and I ground up dried soaked methi leaves up with the garlic and spices. I also added some Aleppo pepper flakes, though next time, I may use a stronger chili. And I used more of the fresh methi greens than he called for-he only used one cup and I used three. Why? Because too much is better than not enough, I had lots of methi and needed to use it and I really like the stuff. And, it is good for you. You could make it go even faster by pre-frying the paneer cheese over the weekend and keeping it sealed up in your fridge ready to turn into a delicious curry later in the week. Iyer says you can freeze fried paneer, but I don’t really like the texture of it after it thaws all that much. I think it gets a bit mealy. 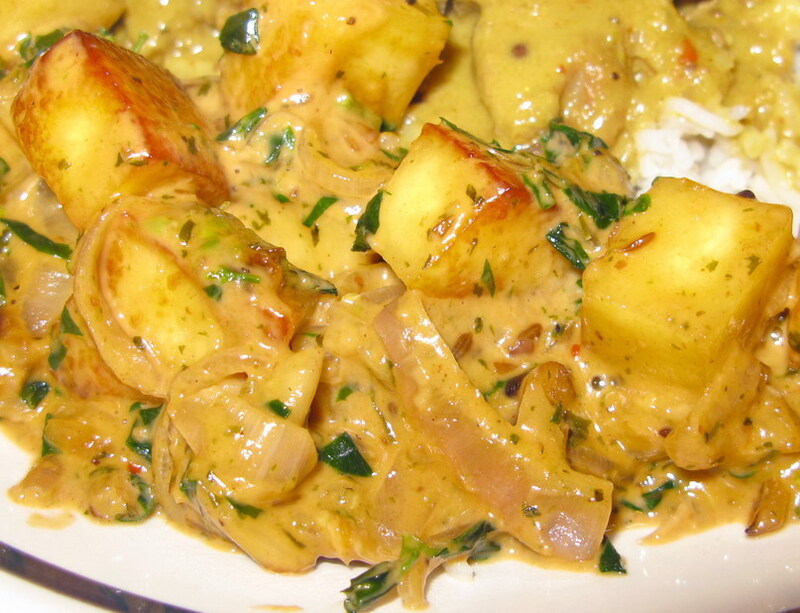 The best part of this curry though, other than the fact that it is creamy, delicious and soul-satisfying, perfect for a cold winter night–is that it leaves your home perfumed with the glorious mown-hay scent of fenugreek. Heat the 1/4 cup of canola oil in a heavy-bottomed nonstick (or well-seasoned cast iron) skillet over medium heat until it shimmers. Add half of the paneer and cook, turning over with a spatula now and again, until it is golden brown and crispy on all sides. Remove with a spatula to drain on paper towels, and fry the next batch. 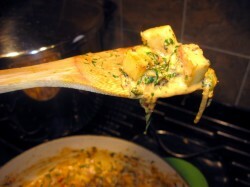 In a heavy-bottomed deep skillet, heat the ghee, oil or butter on medium heat until it either foams or shimmers. Add the onion or shallot and cook, stirring, until the slices turn golden brown. Sprinkle in the cumin seeds, mustard seeds and almonds, and continue stirring. While the onions, spices and almonds cook, grind up the soaked dried methi, garlic, fenugreek seeds, cumin seeds, pepper flakes, fennel seeds, amd peppercorns into a fine, fragrant paste. When the almonds are lightly browned and the onions are a reddish brown, add the spice paste, and cook, stirring for another couple of minutes. Add the fresh methi leaves and cook, stirring, until they wilt slightly–about a minute and a half. Turn heat down to low. Add the cream and tomato paste, then stir in with the salt. Add the fried paneer cubes to the sauce and cook, stirring as needed until the paneer turns soft and spongy–about 5 to 8 minutes. The sauce will also reduce until it thickens and basically clings to all of the other ingredients, leaving very little in the pan. This looks really good! I’ve never had fenugreek, but if someone says it’s as good as collards….well then! I’m off to the Indian store this week to hunt some down! I HATE greasy Indian food from restaraunts, but loved the Trader Joes indian packets when I had access there…do you have recommendations on what to substitute for paneer?? Betsy, you can get it frozen or fresh in most well-stocked Indian markets. Also, while you are there, buy a box of the dried kasoori methi–it is very fragrant, and adds a special scent and flavor to the fresh or frozen greens. Indira’s recipe and photos are great. My mom and I used to make paneer at home. Sometimes, she’d put our cutting board on the paneer ball and use a pot filled with water as a weight. The next day, we’d cut cubes out of the flattened paneer. My favorite way to have the paneer is where it is left free form and used to make mattar paneer, (peas & paneer for those not versed in Punjabi). Thanks for the wonderful post, Barbara! If you’re in So Cal. you can get paneer at Wholesome Choice. Mathi malai paneer looks delicious! This is my first time commenting on your blog, you have a wonderful space here with great recipes! I made this recipe from 660 Curries 3 times already; I prefer using fresh fenugreek though; it also works great with tofu.